I’ve always liked rearranging letters in words to see what other words are hidden in there. It’s sort of like a puzzle and I love puzzles (although oddly not the jigsaw kind). You might be writing a transmedia project where naming a character or a place with an anagram could add an extra layer to the story (and don’t be afraid to cheat and use an anagram generator). When I was coming up with ideas for naming this site, I tried to see if there were any interesting anagrams for the word transmedia. Here are a few I found amusing. 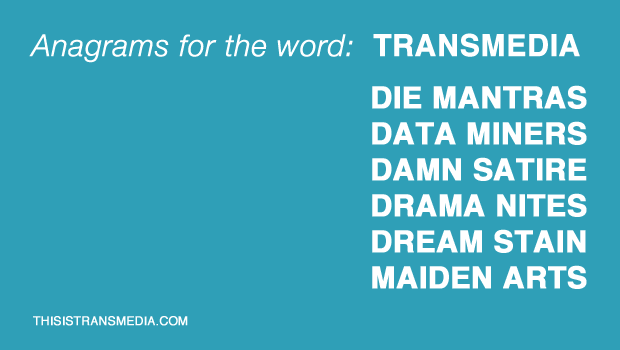 Got any other anagrams for transmedia, or maybe an interpretation of one of these? Caveman Omelet! Er, Leave a comment!